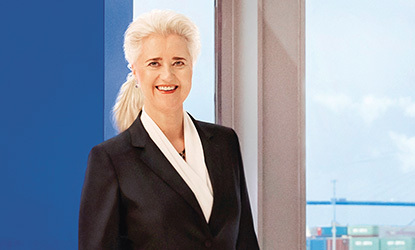 Hamburger Hafen und Logistik AG (HHLA) can look back on a very successful financial year 2018. The already strong results of the previous year were exceeded, with increases in revenue and earnings across the Group. We were true to our word and achieved the ambitious targets we set ourselves. HHLA’s container terminals link ships, rail freight and trucks to create an efficient transport chain. The terminals in Hamburg form the most important European hub between Asia and Central/Eastern Europe. HHLA also operates a container terminal in the Ukrainian city of Odessa and Tallinn in Estonia. HHLA’s rail companies operate a comprehensive transport and terminal network for container transportation and connect ports on the North and Baltic seas, as well as the Northern Adriatic, with their hinterland. Transshipments by truck within the Port of Hamburg round off the service portfolio. In this segment, HHLA pools a wide range of port-related services such as dry bulk, vehicle and fruit logistics. The range of services includes both individual partially airborne logistics services as well as complete process chains. Additionally, HHLA markets its expertise in infrastructure and project development internationally. Following the sustainable renovation of Hamburg’s landmarked Speicherstadt historical warehouse district to create an exemplary redeveloped quarter, HHLA is committed to intelligent site development and preserving the city’s fishing tradition with the Hamburg-Altona fish market. Environmental protection enjoys a special status within HHLA since terminals near cities need to be planned and operated with the environment especially in mind. HHLA’s ambitious target to reduce specific CO2 emissions per container by at least 30 % by 2020 compared to 2008 has already been achieved in 2018 at 31.7 %. is the share of throughput-related CO2 emissions in international supply chains. Over 80 % originate from sea transport. Highly competent and hard-working employees form the foundation of our success. As HHLA’s aims to provide its services predominantly with its own personnel, the long-term positive development of the company results in additional jobs, currently mainly in the Intermodal segment. The commitment to society also includes providing knowledge about port logistics. For this reason, HHLA supports a large number of educational projects, especially for school children, and contributes to social responsibility through an active dialogue on topics relating to the port industry. Net value added serves as an indicator for the economic added value generated by HHLA. Added value is shared between employees, shareholders, the state (taxes) and lenders. The added value ratio of HHLA rose by 8.5 % against previous year.